In an era when wooden houses were common and heating was provided by open fires, the danger of a conflagration was never far away. The parishes of Ingatestone and Fryerning were aware of these dangers and provided a remedy – a fire engine. The two parishes jointly paid towards the expense of the engine and a team of 8 firemen. It was housed in the south porch of Ingatestone church. 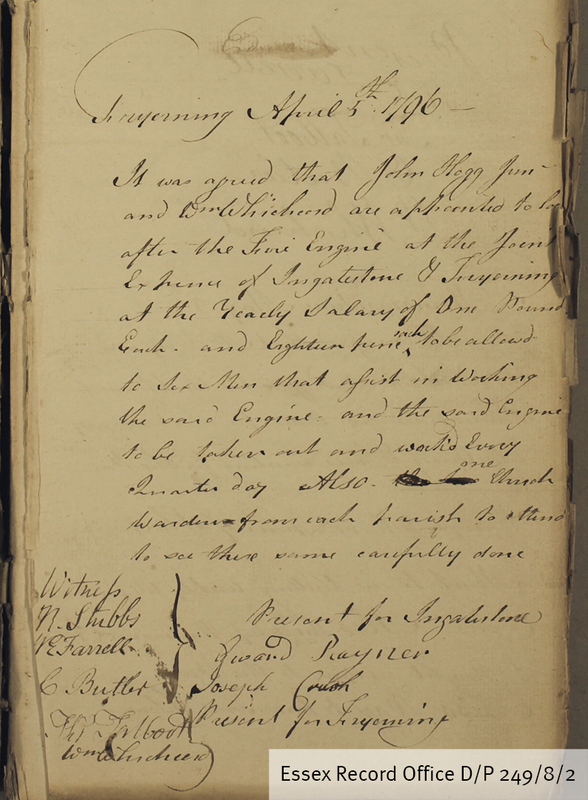 The Fryerning vestry minutes for 5 April 1796 (D/P 249/8/2) show that two men were paid £1 per year to look after the engine and 18d was allowed to each of six men for assistance in working the engine. In 1796 John Hogg junior and William Whichard were appointed to look after the engine, including washing it every quarter day. A church warden from each parish was required to go along and witness the washing of the engine to ensure that it was done carefully. The fire engine was moved to the Market Place when the south porch was dismantled during the Victorian renovation of the church. Then it was housed in the old waterworks in Fryerning Lane and eventually moved to a new fire station in the High Street. Unfortunately this particular record does not tell us what kind of fire engine the parishes had (a bit more digging required), but it would likely have been a hand-pump fire engine with handles worked by men on each side to pump a continuous stream of water. It may have been drawn by horses to help get it to the scene of a fire as quickly as possible. The vestry minute book will be on display in the Searchroom throughout November 2015.